When I realized that I will be passing within 100 miles of one of the best and most trusted suppliers of photographic chemistry and supplies, I could not resist the urge of paying them a visit. Photographers Formulary has been there as long as I could remember. 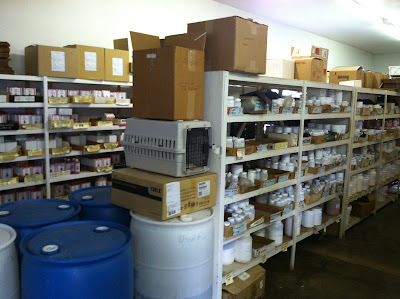 They sell raw chemistry for traditional and alternative photo processes. I really wanted to see the operation and meet the people behind it. 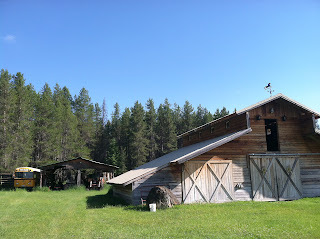 I spoke to Bud Wilson, the owner, and started to drive up to Condon from Missoula. With me came Alyssa Hands - a photographer artist and singer in her own right. It was great to have someone to keep me company on the long road. 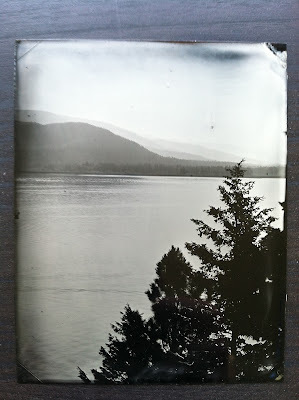 For a while the highways followed a river and we found a spot to make the first tintype of the day. Alyssa on a small outcrop of rocks by a stream is all the was that we needed to create the following plate. The experience of being tintyped can be tiredome and at some point after we took off again Alyssa dozed off on the couch. This meant that I was left driving up a two line highway winding through the woods alone. This was also the first place so far where I didn't have call reception, so I was looking for the town of Condon without aid of GPS. By Bud I was instructed to look for large landscaping rocks, plus I was looking for some sort of activity usually associated in my mind with a town. Little did I realize that the town consists of a long stretch of highway with 3-4 activity-lacking structures on either end of it and 4-5 in the middle. The imaginary row or giant boulders never appeared either. I passed the town and only realized it when the bus came out of a State Forest, which I remembered seeing on a map as being way north of Condon. I raised the alarm to my sleeping companion and she said that if we were indeed that far north then Swan Lake was not far ahead and we should go there. I agreed and indeed the lake was just a few miles ahead. Swan Lake is a typical Montana lake - gorgeous, surrounded by mountains and pines and asking to be photographed. From a pullover that overlooks part of this rather elongated body of water the two following plates were made. While these plates were being washed a tired-looking bicyclist pedaled past us, but turned around with the word 'Ok, educate me'. 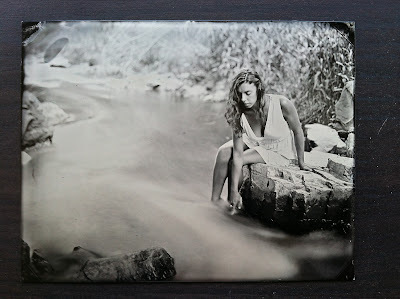 We had a nice conversation about photography, tintypes and traveling alone. Turns out the guy is from California and was on a Great Divide ride, which he started in El Paso TX and was about to finish by the Canadian border. He said that just that morning came out of a 30mi off-highway run and it went through the forest without him seeing a soul, so he decided to come back to civilization and bike on the major highway for a while. 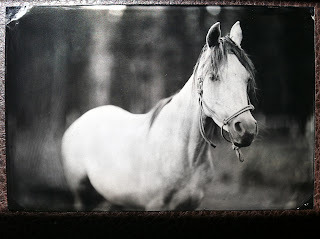 He was very thankful for the explanation of the process of wet plate photography and said we made his day. That's always nice to hear, but the day was not over yet and we need to get back and find out destination. With Alyssa awake it was much easier to find the town. 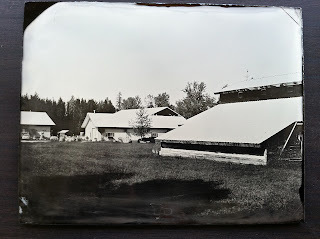 When she saw two or three building on the side of the road, which to me would have appeared unoccupied, she said that that's post office and store and we must be entering the town. Photographers Fomulary was not too far now and we were told by some folks at the store to look for a Bed and Breakfast sign. It appeared that the rocks that I was looking for were pretty much all on the property and they were visible only if someone knows what to look for. They are indeed beautiful and I drove carefully between them, feeling like I'm entering a mysterious site not unlike Stonehenge. 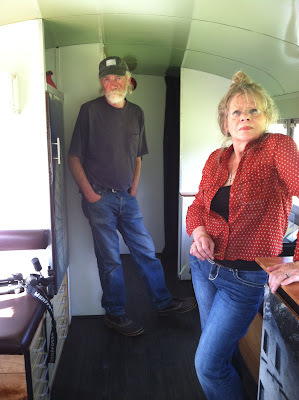 Bud and Lynn Wilson came out to greet us and here they are on board Gilli for a short tour. What a nice and pleasant couple they are. After Gilli was tucked into a nice shady spot I was given a tour and felt like I stepped inside of a dream. The tour started in the dining room that has an amazing collection of alternative prints and plates. 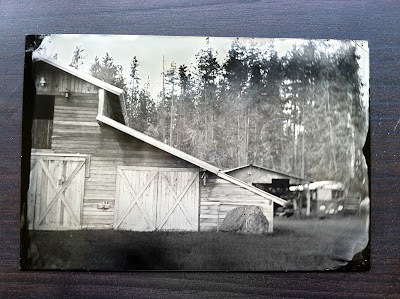 A great inspiration to any photographer who might want to experiment with a new printing technique. I immediately wanted to try them all. 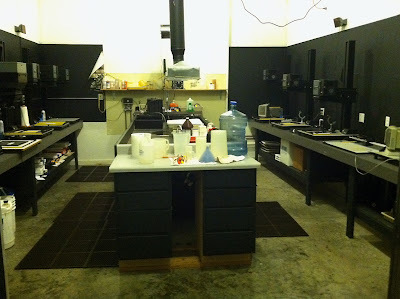 Next was the darkroom. This is where they hold workshops and I must say that this is one of the best equipped, yet not overstuffed, darkrooms that I have seen so far. The Saunders enlargers all have the correct black and white heads on them, and there is even an 8x10 enlarger built on a Besseler base. In fact there is another darkroom for processes requiring UV light - another well-maintained workspace in which a small group of people can be comfortable learning a craft of making images the old-school way. A third room is dedicated to making computer-generated negatives that are used by most today to make their contact prints. Their chemistry space was the one that really made my heart drop. As I mentioned Photographers Formulary supplies small quantity of chemistry needed for pretty much every photo process known and in front of me all those chemicals were lined up neatly upon their shelves. Only wen seeing this display with my own eyes did I realize how close to alchemy photography really is. 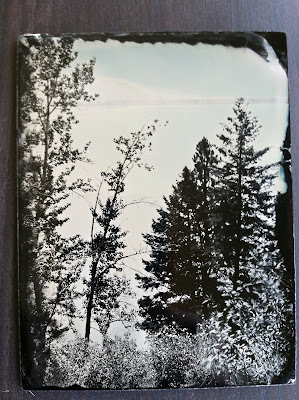 After I stopped looking at all the nifty photo gadgets in the darkroom and being in imagining the possibilities that all the chemistry in front of me presented I saw that there was still time to make some plates and excused myself for the bus. By this time the sun was going down rather fast (in fact in the Wagon shot above you can see that the right lower part of the image is black because in the 4 minutes that I was prepping the plate a shadow crept up and covered that part of the image). I thought to myself "what would be a fun shot that I can finish the day and that can be done quickly?". I looked around for something challenging and saw the horse pen. I have never tried to make a wet plate photograph of any live animal before and that seemed like it HAD to be done fast, so I decided to try it. 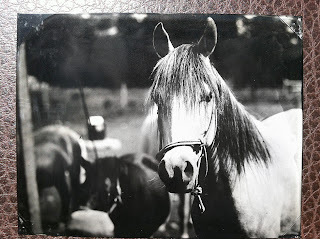 I set the camera next to the pen and went in the darkroom. 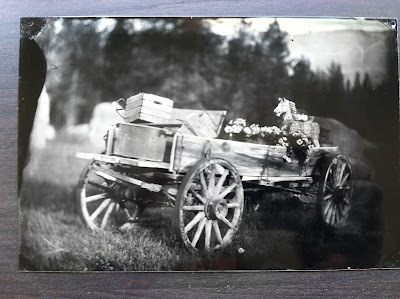 After the plate was coated and was being soaked in silver nitrate I came outside to see where the horse was and repositioned the camera closer to where I needed to be and did some rough focusing and framing. Then it was back into the bus to put the plate in a holder. Quickly back to the camera, refocus, horse turns, refocus, put the plate in, horse turns, refocus, refocus, plate in, lens cap off, lens cap on! By the time it was processed the sun has gone away and Alyssa and I decided to go see what's happening at the local bar. The story of how we got there, who picked us up and who we met at the bar is too long and fun to tell right now, so it will be saved for the eventual book. The following day I did more plates in the morning and here are the best two. Alyssa had to back at work, so we had to leave by noon. 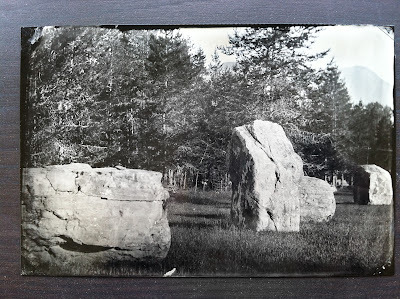 This time I did the plates with a 4x5 camera so the sizes are 3.5x4.x5in. By the way, there are collodion gremlins on the bus. This has happened before and I have no idea who else to blame. I took a wonderful portrait of Bud and Lynn and promised to send it to them after varnishing. Now can not find it for the life of me! I know it was on the bus, but where... The space is really not that big... Gremlins! On my way out I picked up some more chemistry needed for the trip. I highly encourage anyone interested in photography to take one of many WORKSHOPS offered by Photographers Formulary. You can stay at their Standing Stones bed and breakfast (breakfast is absolutely delicious by the way), meet Bud and Lynn. In fact I would recommend staying there even if it's just for a night when you are passing through. You will not regret it - experience of a lifetime! I know it was totally worth it for me just to stop by and I'll be looking forward to being there again. That was a great and fruitful adventure. Let's see what's next! Thanks, Anton....After all these years, you have put a Face to PF. 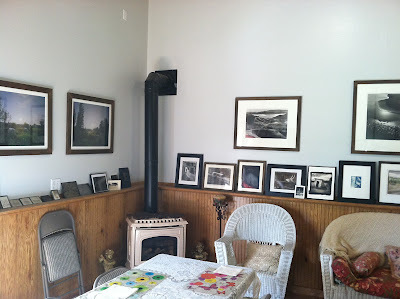 And your images and blog are great......Please keep doing what your doing.